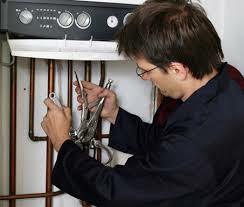 If you need assistance with boiler installation you have come to the right place. Choosing a new boiler can be intimidating but don't worry our experts can help. Having traded for over 30 years we have become on of Dublin's largest boiler installation companies in the 30 plus years we have been successfully trading. With a client list including some of the largest property management companies, insurance providers and the four courts you know that you are in safe hands. If it's time to upgrade and you require a boiler replacement or your old one has finally packed in and you need a new boiler installation our R.G.I. plumbers are here to help. Call us and let us know what type of boiler you need. This may be a combi coiler, system boiler or heat only. Have you any preference on the make and the model. Obviously this can determine prices. We can offer recommendations but ultimately it will be your choice. We would normally recommend Baxi or Potterton Myson. These are high efficiency, good standard mid-range boilers. We give 5 years parts and labor warranty on these makes. If you are looking at something at the low end of the price scale we will happily help but these boiler installations will only come with a 1 year parts and labor warranty. This is because although you pay less to start with the problem we have found is the parts wear out a lot quicker and then purchasing the replacement parts is far more expensive. Once you've decided and a price agreed we will book an installation date. We will be in and out within the day and leave your property as neat and tidy as we found it. We would be delighted to visit your property or business to offer impartial advice, give all options and provide a free quote without obligation. Why choose us to provide your boiler replacement? Large team of very experienced R.G.I. plumbers. If you need the replacement fast we can do. Large, well established company with excellent references. God forbid if there is an issue you can call our office and we'll have someone out immediately. Great prices and a 5 year parts and labor guarantee. Get a great deal on power flushing and boiler installation as a package. No hidden charges or call out fees applied. If you need a new boiler installation or want to check your options or prices please call us on 01-6874853. One of our senior R.G.I. plumbers will be happy to give you all the information you require and a free quote if required.